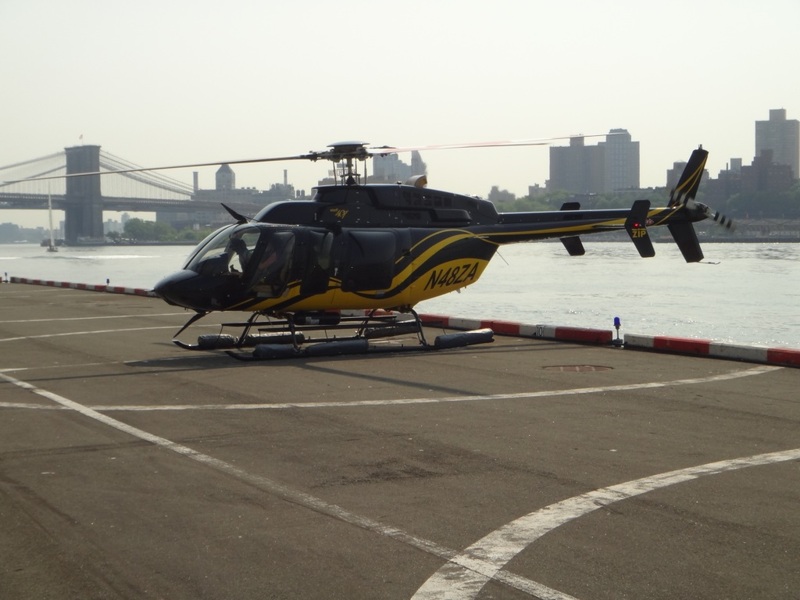 Photograph 1 - Our helicopter at Pier 6 Manhattan NYC - a clear perfect morning. 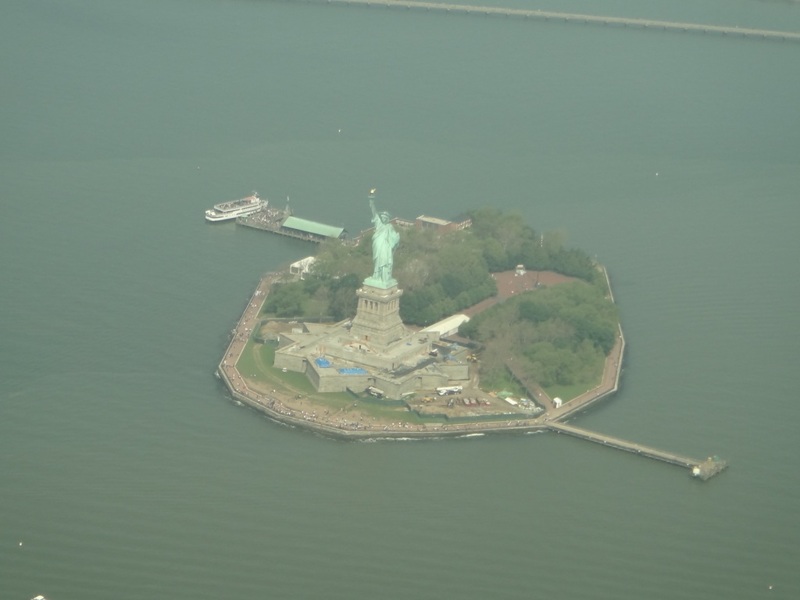 Photograph 2 - The Statue of Liberty from our helicopter. Photograph 3 - Manhattan skyline from our helicopter - note the new tall WTC building on the left - soon to reach 1776 feet. 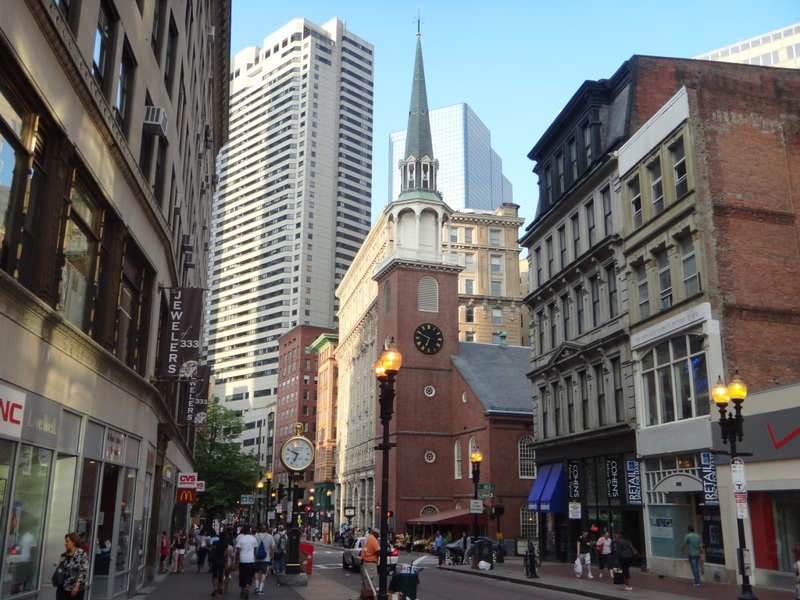 Photograph 4 - Washington Street Boston. Photograph 5 - Boston Common, near our hotel.---------------------------------------------------------------------------------------------------------------------------------------------------------------------------------------------------------------------------------------------------------------------------------------------------------------------------------------------------We are now in Boston MA and a wonderful city it is. Also it is good to be on the hotel's WiFi network which works quickly and without annoying drop outs like we experienced back in Abingdon Guest House NYC. 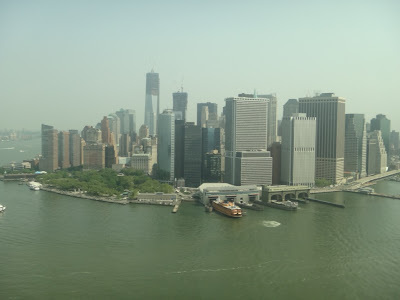 This morning we took the subway to the Heliport and thankfully it was a beautiful morning. Only the usual light smog. It was one of the best days NYC could offer. Anne rode co-pilot for our 25 minute ride whilst poor Neil rode shotgun in the centre with four other passengers. Well..Anne had the best view and snapped many pictures. 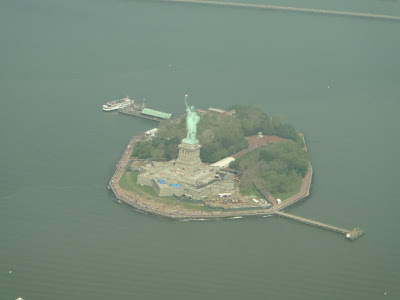 The chopper flew over Brooklyn Bridge up and around Varrazano Narrows Bridge, Statue Of Liberty, Ellis Island and up the Hudson River to the new Yankee Stadium. Back down the Hudson with fine views of the USS Intrepid (there is a Concorde and a SR71 on its deck) and around Battery Park. As said Anne had the best views and her second ride in one of these machines has convinced her that is the way to go. After our ride was a subway back to the accommodation and deposit the keys. We taxied to Penn Street Amtrak Railway Station. The weather was great in fact quite warm. The train to Boston took 5.5 hours and passed the Long Island Sound through Connecticut and Rhode Island. The scenery was all coastal and the houses are designed like those New England houses you see on documentaries, movies etc. We arrived in Boston and found the city completely bussle free (not like frantic New York). The city is clean and has a unique character. We did have a problem with our hotel on arrival. Apparently there was no room for us. They had allowed the guest the night before to remain after check-out. We had booked this hotel back in February, paid for it on-line and even rang to confirm our arrival in NYC yesterday. They did offer us another accommodation 4 miles away which we vehently turned down. After 20 mins or so they did find us a room which was completely inferior to what we paid for. Apparently the hotel is booked out because of the Memorial holiday weekend and other events that's going on. Well....we asked for the manager and when he saw us he wholeheartedly apologised and gave us a great room with city views almost to the top of the building. In view of our frustrating time he gave us free WiFi!!! After we settled in we wandered around the streets ........ Anne bought some more clothes and we had a great dinner at Max & Dylans. It was the best Clam Chowder and seafood we've had in a long while. 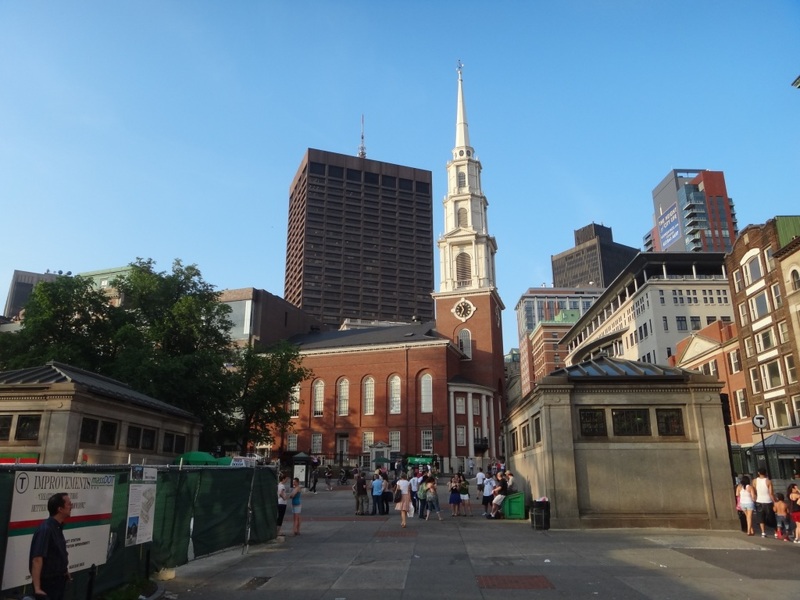 Tomorrow we are off on two Boston tours - one to show us around TV and Movie locations (not again!!!) and a city tour by DUCK (an amphibian WW2 vessel). Until then cheers.